I have a beautiful, spacious dog run in my backyard. When I’m not in the house or out and about, I spend some time relaxing and reflecting there. Two things I don’t do there – never have, never will – are peeing and pooping. Mom and Dad are beyond perplexed by this behavior, and have expressed their dismay on many occasions. Dogs, they say, always do their toileting in a dog run. Then, their human friends diligently clean the run every day, and all is right with the world. Yeah, fine. I care not where other dogs do dog doo. I have my standards, and I refuse to make messes in my living area. If they want to erect an area within my dog run specifically for this purpose, much like a bathroom within a house, I would consider using it. Otherwise, forget it. And another thing: If they know that I relieve myself in the dog run, they may not be so eager to extricate me from those confines to relieve myself elsewhere (and to be with my “pack” where I belong). Dad went so far as to plant a bright yellow stake in the dog run. The stake, which he bought at a local pet store, is designed to emit an odor which invites a dog to take care of business in that location. After planting it and leaving me in the run for 2 hours, he returned to find the stake uprooted and miraculously split into 457 pieces, arranged delightfully and strategically to add color and dimension to my patio. This may have added to the ambience of the place, but it did not have the desired calming effect on Dad. So to my astonishment, he unzipped and actually urinated in the corner of my run!! He said, “In case you need a visual tutorial, here it is.” By the way, my astonishment was primarily due to the fact that he did this without raising his leg, which brought up some gender issues. But I was also offended by such lewd and insensitive conduct. As I am not above an occasional act of justifiable vengeance, I made a mental note to ‘accidentally’ pee in the family room…maybe during extra innings of a big game. Of course, that will result in another outing to the dog run where bowel and bladder sleep like babies…and the circle of life continues. 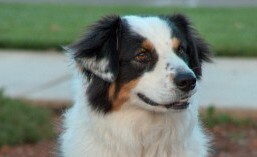 This entry was tagged aussie, australian shepherd, blog, dog, dog training, humor, potty training, toilet training. Bookmark the permalink.